The latest figures from Springboard show retail footfall was down 1.7% on last year in September, with the high street posting a fall of -2.2%, as high-profile retail collapses have made consumers nervous about making big purchases with major high street names. September’s figures for the five weeks ended September 29 represent a slight acceleration from August’s decline of 1.6%, and Springboard attributed the decline to “the unrelenting pressure on households’ budgets”. Wage growth has remained sluggish, whilst inflation continues to tick upwards, with the BRC-Nielsen Shop Prices recording its second month of inflation in more than five years in September, which has left consumers cautious about their discretionary spending. Favourable weather conditions for much of September also presented a challenge for stores trying to attract footfall, particularly as shoppers have little motivation to update their wardrobes for the colder season ahead. No region saw growth in September; the East experienced a sharp decline, down 5.3% from 1.7% in August, whilst Wales was the hardest hit, with footfall falling sharply by 5.5% on the previous year. High Street footfall has now seen two consecutive months’ of decline, with footfall down 2.2% last month. High Street footfall fell in all regions, with Wales and Northern Ireland seeing the deepest declines at 7.9% and 6.1%, respectively. 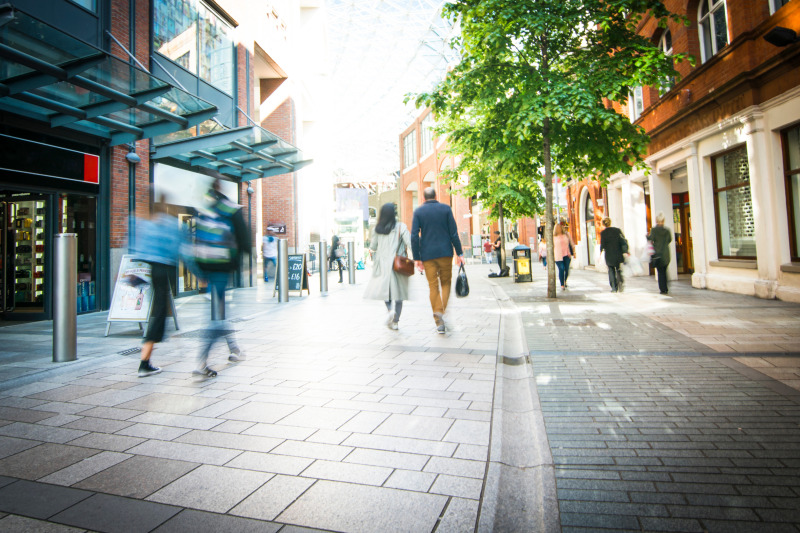 Springboard marketing and insights director Diane Wehrle said: “A drop in footfall of -1.7% in September - an even slightly greater rate of footfall decline than the -1.6% decline in August - provides further evidence of the current challenges facing bricks and mortar retail. “However, whilst it would be easy to put this down to the shift to online spending, the story is not nearly as cut and dried. With the growth in non-food online sales in September of +5.4% being the lowest since January and just half what it was in September 2017, combined with the highest level consumer credit for five years, a recent increase in inflation, a 20% drop in new car sales which is the worst since 2008, and the rise in house prices only a half what it was a year ago, all indicators point to the fact that footfall is simply reflecting the underlying constraints on consumer spend generally. Meanwhile, retail park footfall growth slowed by 0.1% in September from 0.3% in August. The East saw a negative swing from +5.1% in August to -5.6%. Northern Ireland saw an end to its four-month growth, falling by 6.1%. 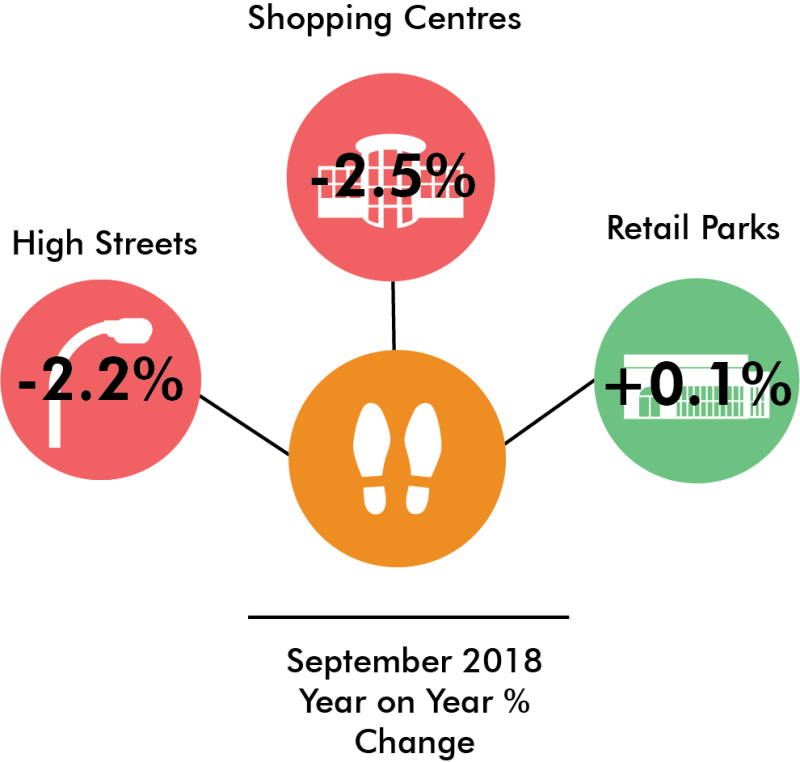 Shopping centre footfall continued to decrease, but at a decelerated rate: in September it fell by 2.5%, compared to August’s fall of 2.4% and July’s 3.4% fall. September is the eighteenth consecutive month of decline. British Retail Consortium (BRC) chief executive Helen Dickinson said of the results: “September saw a continuation of the trend for decreased footfall at UK shops, with overall figures down 1.7% on September 2017. Shoppers are feeling the squeeze of increasing shop price inflation and little real wage growth. “This month's footfall figures are yet further demonstration of the increasingly difficult operating environment British retailers are facing. And yet, the country's largest private sector employer is not seeing any action from Government to help.